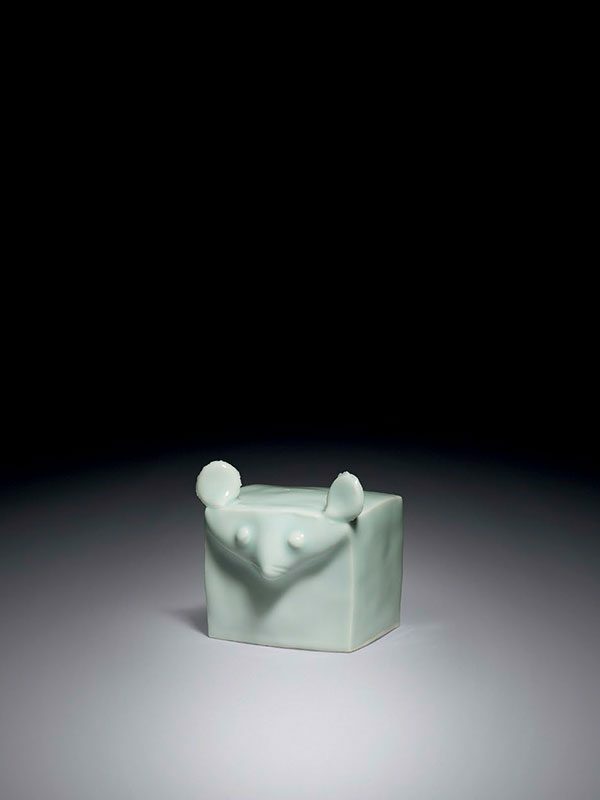 A stylised okimono of a mouse, of square section, with pronounced ears, completely covered in a celadon glaze of pale green colour. With the original tomobako, inscribed Osamu Suzuki. Suzuki Osamu (1926-2001) began his career in 1948 with his co-founding of the group Sodeisha (‘crawling through mud association’), dedicated to the creation of works, independent of ancient types, and made by artists who refused to exhibit at established studio craft competitions. At the time, this was nearly a heretical philosophy. Suzuki and his colleagues consistently strove to stand apart from traditional works – both stylistically and technically. By the mid-fifties, non-functional work became his focus. Suzuki’s influence then and now remains huge and he became one of Japan’s most important ceramic artists of the 20th century. He taught at the Kyoto Municipal College of Fine Arts and his works have entered the collections of museums throughout the world. Suzuki Osamu has received tremendous recognition throughout Japan, including a highly praised, enormous retrospective in 1999 that toured five major Japanese museums.